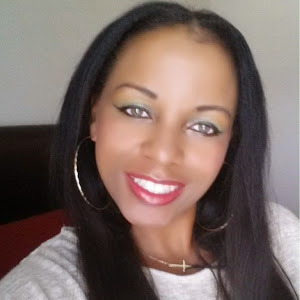 As you can tell from the pics and my falsies, this a post I should've had up month ago. Kinda gotta lost in the files. Anywho, I've been over the magnetic trend for a long while. Companies hopped on the wagon a little too late in my opinion. I saw this display in Rite Aid a while back and the colors are what truly caught my eye. I thought that even if I don't use the magnet they would be great additions color wise as I've been using my China Glaze magnetic polishes in this manner. I picked up 2: Snake It Out and Polar Opposite. 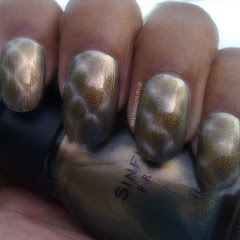 Sinful Colors managed to incorporate snakeskin patterns and shimmer. What's not to love right? The magnets are removable so you could interchange the various designs if you so desire. The magnet itself is pretty strong and worked really well, although having these tips on it was hard to get the effect on the full nail. So if you have really long nails this could pose a problem. Snake It Out colorwise runs in the same family as OPI' I Spotted a Lizard (see my swatch and review here), Maybelline Color Show Boho Gold, Chanel Peridot, and a host of other gold toned polishes that have that blue green shift. It starts out a beautiful gold color that allows some silver tone to peek through once "magnetized" Very pretty. As with all the other polishes in this color family, the shift is best seen under water so here's an under water shot for you. Polar Opposite was a great surprise. I chose this because of the silver base and blue flecks. 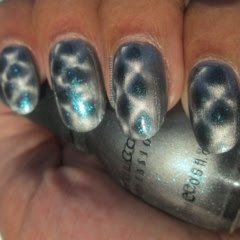 Before applying the magnet Polar Opposite is a frosty silver with aqua blue flecks in it. The magic happens with this one once the magnet is applied. I don't have a camera wise enough to pick up the beauty of this beast. The magnet reveals a almost black/dark gray polish with loads of aqua blue flecks. Like I said this threw me for a total surprise. Swoon! I failed with the magnets on these polishes but it's definitely user error and not weak magnets. 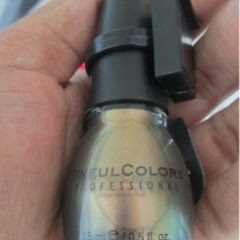 These retail for about $5 so a little bit more pricey than the regular Sinful Colors polishes. 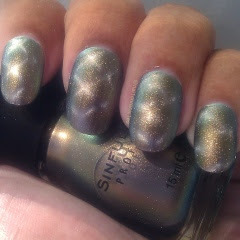 If you are still into magnetic polishes these are definitely worth seeking out. I do have one more from this collection that I've yet to swatch so I'll try and get that done soon. Being that my natural nails have grown out I should be able to get a better result from the magnet. Have a great Sunday!! !